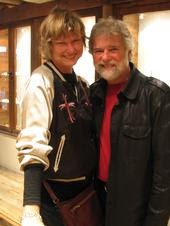 The legendary Chuck Leavell and his lovely wife Rosie in Crazy Pig Designs picking out some goodies to take back to the states. Chuck was a founder member of the Allman Brothers but nowadays mainly just plays with The Rolling Stones. a lot of which was custom made and designed by Crazy Pig Designs for the movies. We made a lot of items for Professor Slughorn in Harry Potter and the Half Blood Prince. In this shot he's wearing his watch chains and custom cufflinks. 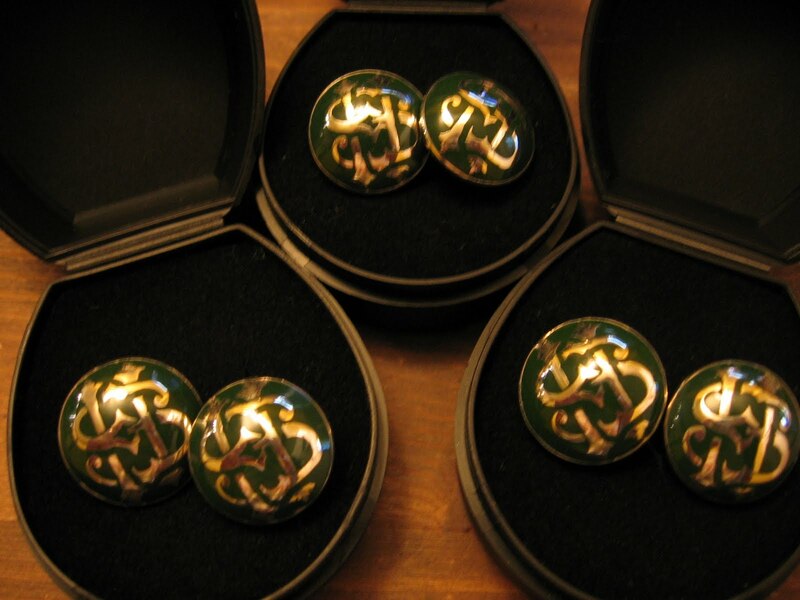 The cufflinks were monograms of his name Horace Slughorn. 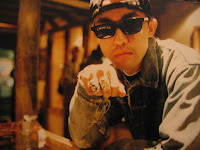 On the right hand side of this picture is the classic Futura designed UNKLE logo that Armand made into a ring for Jame Lavelle. 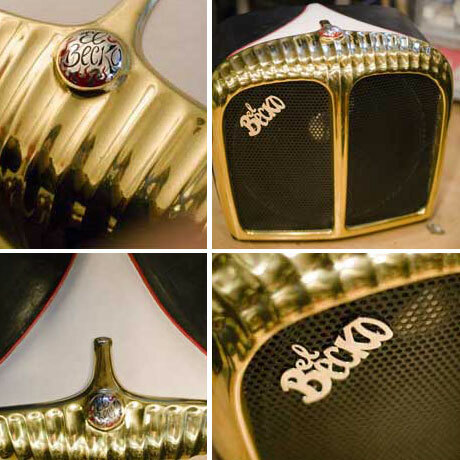 The guitar and amplifier maker Phillipe Dubreille was asked to make this amplifier for Jeff Beck from Chrissie Hind of The Pretenders fame. 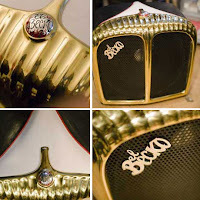 Phillipe came to us and we made the El Becko Silver "fuel cap" and the silver El Becko logo. I think it landed up looking and sounding pretty cool. 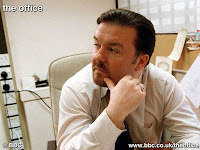 Ricky Gervais, seen here in his series The Office wearing our Signet Fleur De Lys ring. 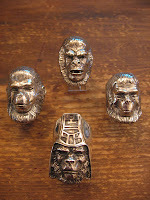 Marc Wooton came into Crazy Pig Designs to collect his new Cornellius Planet of the Apes ring today for the premiere of his new movie Nativity. He just got his first US Comedy series, which he said is even better than his classic My New Best friend series he did for channel 4.
our Classic Small Evil Skull Ring in Gold. When Tomoaki "Nigo" Nagao owner and designer of A Bathing Ape fashion empire wanted to get some jewellery made for his company who else would he turn to but Crazy Pig Designs. 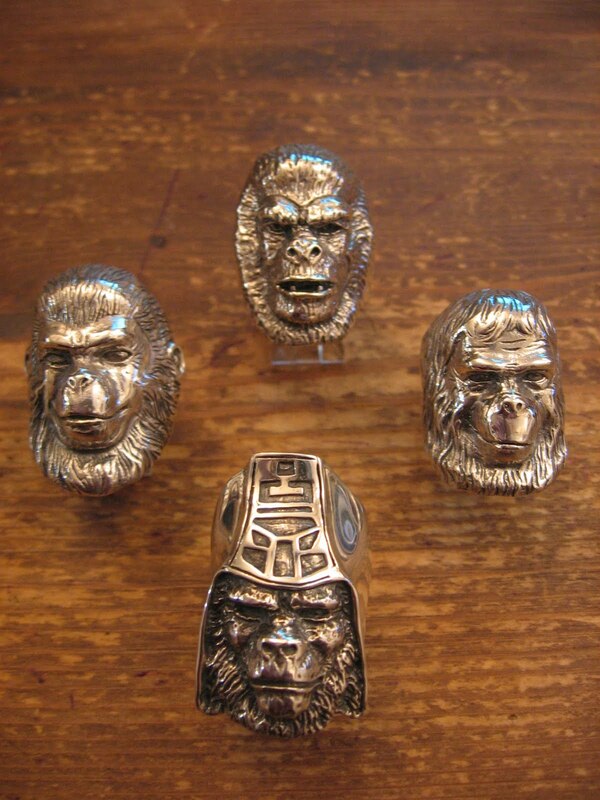 We made a range of Planet of the Apes rings for A Bathing Ape and these rings are available on our website. We were asked to make a ring for Johnny Depp in the movie Sweeney Todd, problem was the wardrobe guys had already made him a "ring" which he had worn in the first few scenes. 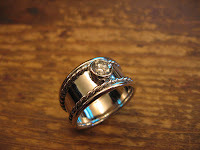 We were therefore restricted design wise with what the ring could look like. 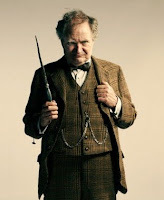 We obviously made loads better than the one used in the first few scenes but we weren't over the moon with it. 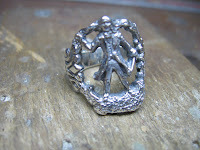 The ring we made was still in the movie on Johnny Depps pinkie. Here at Crazy Pig Designs we always say we only like to make jewellery that we think is cool or would look pretty cool. So with this ethos in mind we've made we made quite a few Pieces inspired by Old School Classic Tattoos over the past few years. Most recently we made a Limited Edition True Love ring which in silver is strictly limited to 500 pieces worldwide, each one stamped with their individual number. Want to win a free Crazy Pig Designs ring? We are running a little competition with the legends at Road Runner Records in New York. This competition will be taking place in the coming weeks and we'll be announcing the start dates here. It helps to have fans in high places. 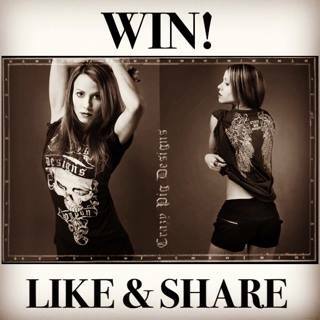 We have set up our Crazy Pig Designs Facebook group page. Come and have a look and join in if you are a facebook member. 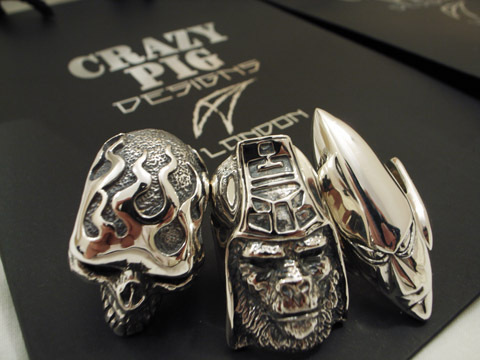 We hope for fans and customers to start uploading photos of them wearing their Crazy Pig Designs jewellery. and old family heirloom Diamond that he had. So far they've been 20ltd's best jewellery seller.